LEGO Star Wars books usually contain exclusive minifigures and the latest edition of the LEGO Star Wars Visual Dictionary features one such character. 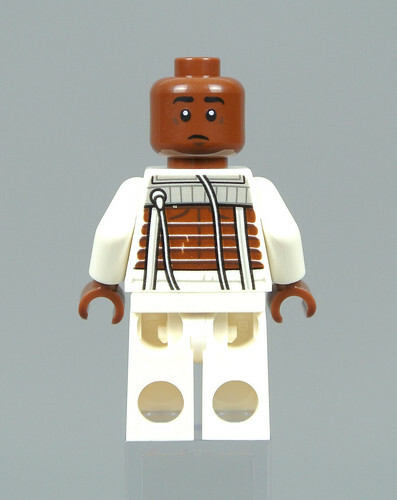 This version of Finn sports an unusual bacta suit, corresponding with his appearance at the beginning of Star Wars: The Last Jedi. Choosing to produce this minifigure during the twentieth anniversary of LEGO Star Wars seems odd in my opinion. However, he is quite unlikely to appear in a standard set so I am delighted to add another unique minifigure to my collection. After being defeated in a lightsaber duel against Kylo Ren, Finn wakes up wearing a bacta suit during Star Wars: The Last Jedi. 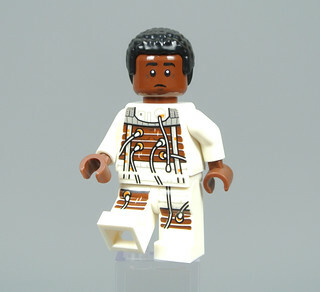 This minifigure therefore looks slightly strange, wearing a white medical suit which leaves several sections of his torso and legs visible. I am impressed with this effect and like the tubes that connect different areas of the bacta suit as this closely resembles his onscreen attire. Printed arms would have been welcome but the new head is excellent, especially since this is the first reddish brown head to include a sleeping face. I appreciate the worried expression on the reverse too as this accurately captures the character's emotions upon waking up at the beginning of the film. This textured hair piece is similarly impressive when compared with the source material. 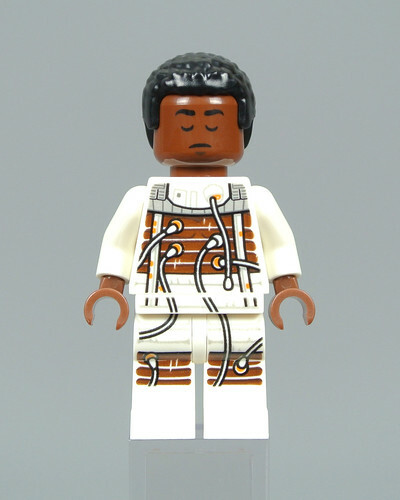 Numerous important characters remain absent from the LEGO Star Wars range and Finn wearing his bacta suit is not the minifigure that I would have chosen for the book. Nevertheless, I am pleased with this rendition of the Resistance hero as the bacta suit is intricately detailed and the unique head could prove useful beyond the Star Wars range. Furthermore, the latest edition of the LEGO Star Wars Visual Dictionary is very enjoyable. It contains plenty of interesting information about the Star Wars theme and encompasses almost every set which has been produced during the last two decades. I would therefore recommend this book to LEGO Star Wars fans, particularly following a discount. I hope you have found this review informative. Let us know by liking this article and share your thoughts on the minifigure in the comments below. The awake expression looks like Charles Shultz’ work. I am a bit surprised the back has no detail showing the scarring from the lightsaber (unless bacta magically cures that?) but it may have made it looked a bit to cluttered so it makes sense it was omitted. Love the bewildered expression, but I agree that another character could have been picked. Would it be worth buying the New Edition of the LEGO Star Wars Visual Dictionary if you already own the Ultimate LEGO Star Wars book? Really would have preferred Willrow Hood here, lads. "Finn leaking suit naked? Did Lego fry a circuit?" This is an interesting mini figure the only problem I have with it is: I didn't like the last Jedi. Why didn't Leia get one of these after she turns into a wax figure and uses the force to pull herself back into the ship without freezing or burning up? A TOTALLY "useful" mini figure. A pretty decent minifig, but selecting a character from a weak scene in a weak movie seems a strange choice for the book, especially in the anniversary year. They are keeping the good stuff for the 25th anniversary. Happy anniversary, Lego Star Wars! Here's one of the most useless characters in a painfully destructive film that does not earn the name Star Wars. Luke. Vader. Obi-Wan. Anakin. Artoo or Threepio. Any of these characters from the real films could have been used. Instead, we get "Finn". Sorry for my thinly veiled contempt for the direction Disney has chosen to take the greatest space fantasy ever created. They got.a hundred unreleased figures to choose from and they went with TLJ? Were they forced by Disney? Great minifig. Such an unusual choice. Perfect. I like his alternate "sleepy" and "what's going on?" faces. 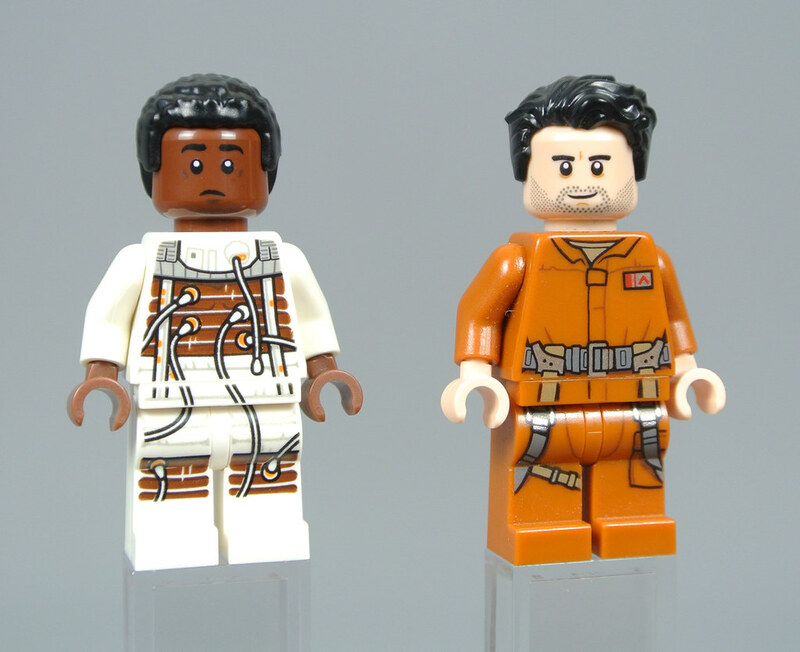 But they need more of these reddish-brown coloured minifigs heads with smiling or happy expressions. I was looking for one this last week (trying to create a specific character) and the only faces available were all either angry, scared or sad. There's, like, one version of Finn who has a cheerful expression that I had to repurpose. Kylo should of done his job properly in the first place in TFA so this figure and half of TLJ wouldn’t have been needed. The only character I can really think of *desperately* needing a minifigure is Aunt Beru. Just about any other outfit or character that hasn't been done before holds just as much water as this. I get that people may want other characters more, the fact that so many people are so adamantly hating it seems absurd! If it's The Last Jedi you hate so much and you're pushing that hate on to LEGO, at least be glad it wasn't Rose Tico! Luke, Han, Vader, ect have had a ton of figs in the past, give one of the newbies his time to shine! Now we just need a Mary Poppins Leia minifig. I never saw this amount of complaint when we got two bacta Luke's and one Darth Vader. I don't understand the hate characters like Finn and Rose receive. I think this fig looks great and will make a nice edition to my collection. @Zordboy The first Cyborg fig from 2015 has a very happy face. I don’t care about the figure, but I agree...I want that head. Personally, I like this figure but appreciate the character simply isn't that popular. My theory is that he suffers from the OT Luke effect in the sense that he's somewhat overshadowed by the other major characters, ie the more charismatic Han/Poe, the more sympathetic Leia/ Rey, the enigmatic Vader/ Kylo and the funnier R2/BB8. Let's be honest, who left a cinema in the seventies wanting to be Luke and not Han Solo? @magpie9 Oh, the minifig looks fine. No problem with it, technically. But I dislike the so-called "sequels" so much that I don't acknowledge them as Star Wars, or as any part of Lucas's ongoing story. I don't buy any books or merchandise that include anything to do with the sequels and their subpar, obnoxious characters, the lazy repeat of the Empire and Rebels ("First Order" and "Resistance"? Really?) or the uninspired "new" vehicles or aliens. I'm not a "hater", typically. But I dislike these films because they took away what made Star Wars so special (to me, anyway) in the first place, George Lucas's story, and I'll stand against them until the end. I like this fig. I'll pick it up when the book's 4 quid in TK Maxx somewhen down the line. I liked Finn a lot in TFA, but this scene really didn't do much for me in the movie. Decent design work on the minifigure, but I can't imagine why we got this instead of Therm Scissorpunch. The fig looks great and will be a good addition for folks looking for exclusive variants. I need to remind myself to never read the comments associated with the SW sequels (sorry, "so called sequels") as people get way too worked up about it. There are a lot of SW movies I haven't enjoyed but they don't all need to be made for me. I enjoy liking the ones I like. "Painfully destructive film". <- I'm not sure what this is even supposed to mean. @tremendo Hopefully you don't take my comment personally, I'm criticizing the movies, not their fans... but I referred to it as "painfully destructive" because Johnson, in his artistic arrogance, dared to ask why we like Star Wars by challenging, and destroying, so much of it, with the message, "Let the past die". I normally don't have a problem with this, but Star Wars isn't just another sci-fi franchise, it's one man's story with a franchise built around it. It doesn't try to continue the story, it tries to lecture us about what we love about it, and it just doesn't work. Not my favorite minifig; mind you, I'm not wild about the Bacta versions of Luke either. I purchased the book from Amazon. It is definitely an updated version as it even mentions new 20th anniversary sets coming out. Many of the sets from the past couple years are shown and talked about I the book. It's a great buy.